Spring sign up couture is here and better looking than ever. Turn heads this spring by using our new sign up layouts with multiple photo options! 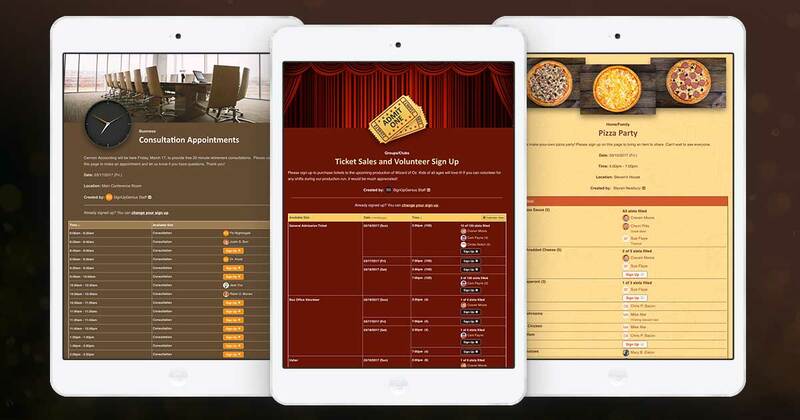 Just in time for spring event organizing, SignUpGenius Pro users can now accessorize their sign up designs by choosing from a variety of layout templates. The color and photo combinations are endless, and the tool is simple to use. Simply go to the “Pro Tools” tab while logged into your account and click on the “Manage Themes” button from that page. Then click on the orange “Add Theme” button in the top right corner. Select the “Blank Theme” option from the pop up window. The tabs across the top of the next page will let you completely revolutionize the way you do sign ups. Let the transformation begin! Design Tab - From our palette, select colors for your background, buttons and text. Layout Tab - Choose a template based on the number of images you’d like to add. Images Tab - Browse from over 1,600 stock photos in our image library or upload your own. Not ready to go completely custom? No worries, you can use one of our handy templates to get you started, then add several additional pictures. From the “Add a New Theme” pop up, select “Stock Theme.” Browse our designs to find the perfect match, and then follow the Design, Layout and Images tabs to enhance and add to it. Once your theme is ready for its close up, be sure to name your theme and click the green “Save” button. You can then create a sign up as you always have in our easy to use wizard, and in step 2 you’ll select “My Custom Themes” from the theme dropdown menu to find your high-stylin’ new sign up design! Now work that event-organizing runway like you mean it. 1. The email address of the sign up creator. If you have that email, go to SignUpGenius.com and click the magnifying glass icon in the upper right side of the homepage to search for your sign up. Enter the creator's email on the next screen. You will then see all of the links to active sign ups associated with that email. 2. An invite to the sign up. If you received an email invite to the sign up, you will see the link to the sign up in the email. Follow that link to the sign up. In addition, if you have received an email invite to a sign up and have an account with us, you can go to SignUpGenius.com and log into your account to view the sign ups you've been invited to. If you do not have the sign up creator's email or an email invite, you can contact the sign up creator, school, or organization to request the link. How do I sign up for Spoleto usher?